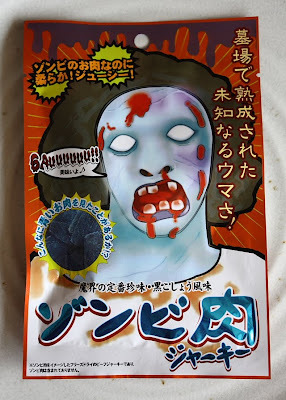 Ananka's Diary: Zombie Meat for Sale in Japan! Zombie Meat for Sale in Japan! Considering that zombies are supposed to be (or have been) humans, this is really messed up and sick. That is the GROSSEST think I've ever heard of!!!!!!! omg . . . . . . . . . . . . . zombie meat lol am i the first comment? haha yay! Ahem. Um, I really don't want to be branded as a cannibal. But really, a twin pack? If it's cheap, I'll buy it. yum! that almost makes me want to rethink being a vegetarian! Great interview on the today show Kirsten!!!!!!! Someone beat me to the vegetarian-comment. that company needs to make a deal with that pizza place that uses coffin wood so the zombie jerky can be used as a pizza topping. they could make a fortune if they sold it to the rats in the shadow city(if rats have money. i think its just squirrels that mug people.). but is that actually human flesh? if it is, everyone who eats it will probably get the human version of mad cow disease(but i dont think cows are the only ones to get it, i think chickens have gotten it too), and in weird funeral things, some people got it because they ate the dead and got mad cow disease-human version. and this makes me wonder if the donner party got anything like that, or the survivors of that college rugby plane crash in the andes from like maybe twenty years ago, im not sure about the date.......someone needs to have iris' parents investigate this, theyre anthropologists, arent they? sorry for the novel, i have a hard time shutting up. Al Fonzo: I don't mind Kiki Strike being given out for free. The more readers, the merrier! But thanks for the update! I like having eyes and ears all over the country. MI & Kathleen: Thanks for watching!!! Anonymous: You and I think alike. I'm not sure that's a good thing. Hahaha. Goodness that's brilliant. Funny how all of the vegetarians (including me) are most amused by this... Ah well :) I think Japan is heaven on earth for me. But What Do They WANT?!?!? !